The couture-gown-creating and pug-loving Valentino lives a life that is the ultimate study in mannerly elegance (even the china plates he dines on are exquisitely patterned). I've been intensely fascinated with this design icon ever since I saw a program on the stylistic intricacies of his beautiful villa and gardens in Italy, and I was awestruck with the utter artful decadence of his lifestyle. 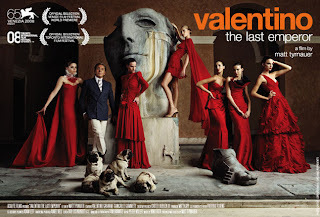 Valentino: The Last Emperor will be opening at Film Forum on March 18th, and the film promises to be as fascinating as the gentleman behind the fashion empire. For another fashion documentary consider Yves Saint Laurent: His Life and Times/5 Avenue Marceau 75116 Paris, the first film a biography of the then young designer and the latter a behind-the-scenes look at creation of his last Spring collection. For another fashion documentary consider Yves Saint Laurent: His Life and Times/5 Avenue Marceau 75116 Paris, the first film a biography of the then young designer, the latter a behind-the-scenes peak at the creation of his final spring collection.